Marvel Studios has released 10 new Captain Marvel character posters. The studio is, as of this writing, 50 days away from releasing the highly anticipated movie and expectations are high. Thankfully, the standalone Carol Danvers movie is tracking to have a pretty impressive opening weekend with lower estimates at around $140 million and higher estimates around $180 million, which means that it could very well have a record-breaking debut. 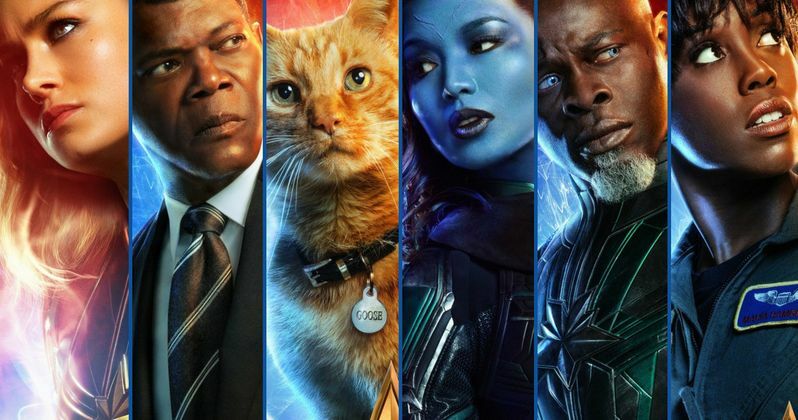 Obviously Goose the Cat has been chosen for one of the latest pieces of Captain Marvel promotional material, leading one to believe that he's going to have a much larger role than just being a normal feline companion. Goose may have some powers from the comics, which could be very interesting and may actually be how Nick Fury lost his eye. Speaking of Fury, he's also featured in the latest round of character posters with two working eyeballs and a pretty intense look. The studio used de-aging CGI on Samuel L. Jackson to make him appear younger for the early 1990s timeline. Brie Larson looks like she's getting ready to give someone a blast in the Carol Danvers character poster. No masks included here, just the traditional blue, gold, and red suit with a pretty intense look to match Nick Fury's in one of the other posters. Maria Rambeau is also included in the Captain Marvel character posters. Lashana Lynch plays the character in the movie and she recently revealed that Rambeau is a tough single mother and according to Larson, she is the "representation of love" in the movie. Obviously, specifics are being kept under wraps for the time being. Jude Law's Yon-Rogg is featured in his own Captain Marvel poster. It has yet to be officially revealed that he is only playing Yon-Rogg, and he could be playing another character, though that is a mystery at this time. Marvel Studios have gone out of their way to keep Law's role shrouded in mystery over the past several months. Annette Bening's mystery character is also featured in her own character poster. Many believe that she might be playing Captain Marvel's creator or at the very least an authority figure, which could mean that she's playing Mar-Vell, the original Captain Marvel in the comics. Korath, Minn-Erva, and the human form of Talos are shown in the Captain Marvel character posters too. Ben Mendelsohn's Talos is able to infiltrate S.H.I.E.L.D. and becomes Nick Fury's boss. As with most movies where Mendelsohn is the villain, he should knock this role out of the park. Last, but certainly not least, is Clark Gregg's Agent Phil Coulson, who like Samuel L. Jackson, has been de-aged for the early 1990s timeline. With only 50 days to go, the countdown has officially begun and Marvel Cinematic Universe fans are probably starting to get pretty excited to see how Carol Danvers fits into the world. You can check out the Captain Marvel posters below, thanks to Disney.